SteelSeries takes a good idea and makes it even better with the SteelSeries Shift, a gaming keyboard with many different faces. What's in the box: Keyboard, standard keyset, instructions. Back in 2003 a company named Ideazon released the Zboard, a keyboard that allowed players to swap in and out custom made keysets created specifically to support popular video games. It was a novel idea, but the execution was poor. Peripheral maker SteelSeries has been handling distribution of the Zboard since purchasing Ideazon in 2008. Now the manufacturer has taken the original technology and refined it to create the SteelSeries Shift. It marries the face-swapping properties of the Zboard with high quality materials and enhanced functionality to create a device that's more than the sum of its parts. The basic SteelSeries Shift package includes the keyboard base and a standard keyset. There are versions available that come with the new World of Warcraft: Cataclysm and Medal of Honor keysets, but for review purposes we were provided with the plain vanilla unit. One free USB port is required to run the keyboard, but you'll want an extra to take advantage of the Shift's built-in USB 2.0 ports. The cable bundle also includes speaker and microphone plugs so you can plug speakers or a headset directly into the keyboard, which is always handy. Changing out the keyset is a simple procedure: just flip up the latch on the right side of the keyboard and lift. All keysets for the Shift fold neatly in three places for easy storage. When a supported keyset is connected, the SteelSeries Engine software automatically loads. Customizing the keyboard is easy as well. The user can either record macros on-the-fly using a macro shortcut recording button on the keyboard's face, or go into the SteelSeries Engine software for deeper customization options. It'll even handle timed actions, so if your game requires rhythmic button-pushing, then you're definitely in luck. I was even able to completely disable my caps lock key, forever saving me from accidentally yelling at my online friends. For a keyboard mainly based around the whole interchangeable keyset gimmick, this is one well-constructed and fully-featured piece of hardware. Every key is customizable. If you want to leave the keys alone there are 24 programmable hot keys in three layers. Macros can be recorded at the touch of a button. All of this is controlled by the SteelSeries Engine software, which is one of the simplest, most elegant programs of its ilk. The Shift has the form to back up all of this function as well. With a keyset inserted the unit is durable and stable, with none of the rattle I experienced with its predecessor. Even with the two-position rubber feet extended the keyboard doesn't budge. The two built-in USB 2.0 ports and gold-plated headphone and microphone jacks round out the package nicely, bringing it precariously close to total. Oh, and you can swap the keysets out, which is nice. As stable as it is, the Shift is still one thing made out of two different parts, and problems are bound to arise. Getting used to the split space bar is difficult; I eventually settled into the habit of using the longer left half and ignoring the right. I also had some pretty bad issues, ironically enough, with the left shift key not responding during long bouts of typing. In gaming situations, it wasn't that much of a bother, but since I write thousands of words every day it often became terrifically annoying. Can a gaming keyboard be too full-featured? With the easy-to-use customization options available on the core Steel Series Shift unit, it almost seems silly that the product has the keyset swapping function at all. I'd gladly pay $89 for a keyboard with the quality of construction and features the SteelSeries Shift has, but given a choice between it and a model that was more or less one piece, I'd go for the one that didn't split the space bar down the middle. If you see yourself regularly swapping out keyboard sets or you're looking for a keyboard that gives you the option to prove your love of World of Warcraft or Medal of Honor, then by all means partake. 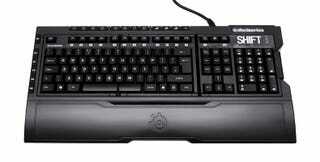 The SteelSeries Shift Keyboard was released by SteelSeries in October 2010. Currently priced at $89.99. A unit was provided to Kotaku for reviewing purposes. Used the keyboard for both gaming and day-to-day writing over a period of three weeks. Tested with the default keyset and the Zboard World of Warcraft: Wrath of the Lich King keyset.